Powder the cashews in a blender till it becomes bit coarse and keep it aside.In a bowl mix in the all purpose flour,cashew meal,corn starch,baking powder,soda and salt.Set it aside.Cream the butter,oil and powdered sugar together well. Now add in the flour mixture and mix it well.Now the dough will be crumbly,to this add around 1/4 cup of the chopped cashews and cardamom powder,mix it well to form a dough.If needed use couple of tbs of milk. Line baking tray with the parchment paper or foil.Take a small gooseberry size of dough and flatten with the palms and keep it on the baking tray.Press in gently 4-5 pieces of chopped cashews on top of the flatten dough.Continue for the rest of the dough.Cover the baking tray with the cling wrap and refrigerate for an hour or two.Bake it in a 300F pre-heated oven for 18-20 minutes(mine took 20 minutes). Cool it on a cooling rack and store it in an air tight container. Instead of flatten the dough and keep it in the refrigerator,make the dough into a log and keep it refrigerated.Then slice and bake it. As these cookies tend to spread,arrange the cookies an inch apart in the baking tray. 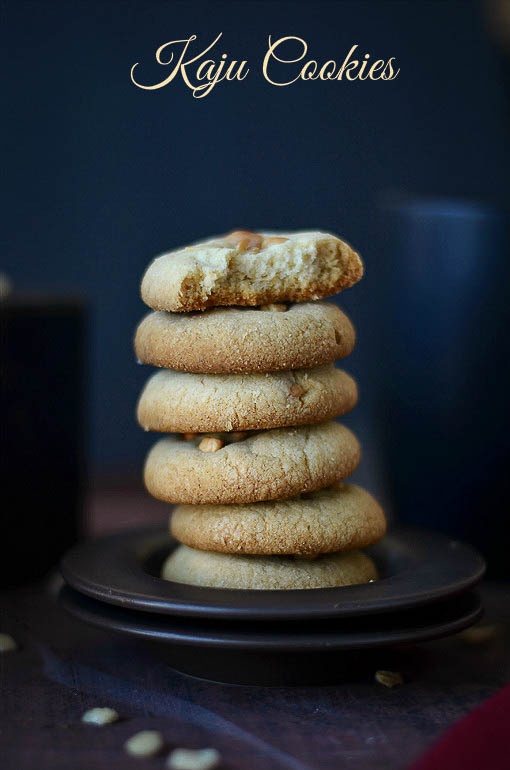 Cashew cookies used to be one of my favorite. Haven't had them in a long time. These look just like I remember them. Those stack of cookies look lovely. Havent heard of cashew cookies. 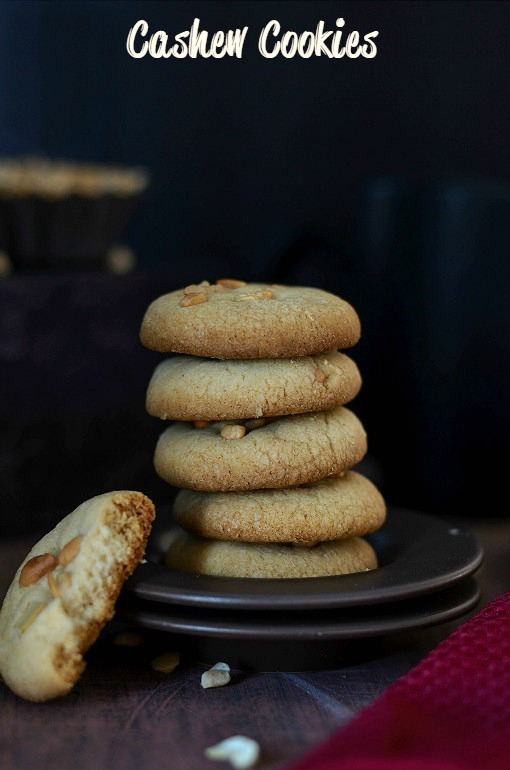 Paired with illaichi, I am sure these must have tasted great..
Beautiful clicks and the cookies have turned out so perfect in shape! wow !! this looks sooo good ! wow. awesome. Using cashew meal is very interesting. Wow nalini, i m eating from the picture, that rainy, moody look is something i m trying to achieve in vain!!! :) BTW crunchy cookies!!! 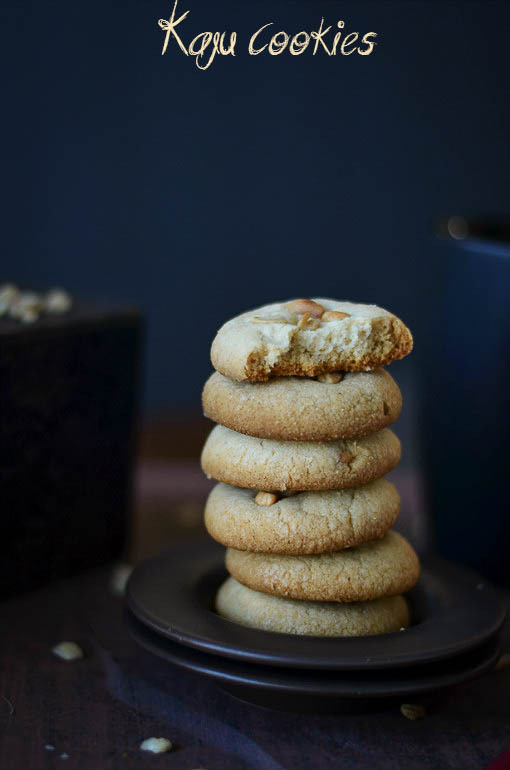 Just drooling over that stack of cookies, crunchy munchies definitely.. I want u to send me some. Super stack of cookies.. The pictures look stunning! 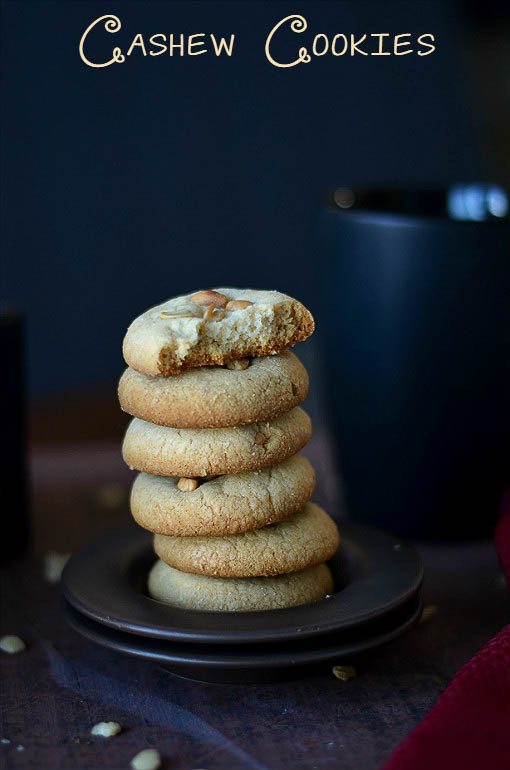 Such a delectable cookies -- they look like they'll literally melt in the mouth. yummy! !